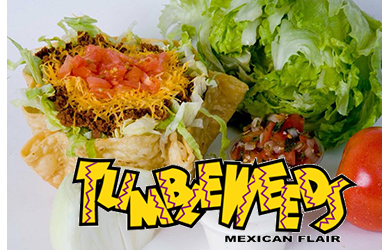 $10.00 for $20.00 - $20 of Food and Drinks at Tumbleweeds for Only $10! Try our NEW Smothered Burrito Available NOW For a limited Time only! Beans, Meat, sour cream rolled and smothered with our enchilada sauce and melted cheese! All of our Salads come in a 10' Flour shell and come with Salsa on the side. Dressing Choices include Ranch, Thousand Island, Sour Cream, and Fresh Salsa. For centuries, tacos and burritos have battled for the top spot in Mexican food lovers’ hearts. 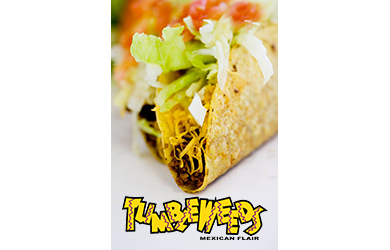 Come show them both some love and explore even more with today’s delicious deal from Tumbleweeds Mexican Flair. Get $20 in Food and Drinks for just $10 and indulge in the best Mexican fare in town! Limit TWO PER PERSON, plus one as gift - One per visit. One voucher per ticket/per group. Not valid on Taco Tuesdays, Online Orders or Delivery. Promotional value good for 90 days. Limit TWO PER PERSON, plus one as gift - One per visit. One voucher per ticket/per group. Not valid on Taco Tuesdays, Online Orders or Delivery. Cannot be used with other promotions or offers. No cash value. Tax not included. Promotional value good for 90 days.